Many dialysis patients are concerned with infiltration. There is a difference between infiltration and a blown fistula. When a needle is correctly placed, it makes one hole into the fistula. An infiltration is when it makes more than one hole by going into the fistula and then out the other side. On the other hand, your fistula can "blow" when the needle first enters it. This happens when the vessel wall is too fragile for the needle and the fistula pops or blows like a balloon. It essentially makes a small tear, which is larger than the needle. This will most often happen from the venous needle because the exiting blood creates pressure in the fistula. This increase in pressure can be too great for the vessel to withstand, causing your fistula to rupture. Again, this is usually a small hole, but the leaking blood can cause quite a large hematoma (a swelling filled with blood). You should monitor for signs or symptoms of infiltration such as immediate sharp pain, swelling, or discoloration. A quick response can help minimize damage to your access. Infiltrations can occur before dialysis, during dialysis with the blood pump running, or after dialysis with the needle removal. The immediate application of ice helps decrease the pain and size of the infiltration and may decrease bleeding time. clot the needle tract and NOT the fistula. In some cases, the decision to leave the needle in place and cannulate (needle stick) another site may be preferred. If the fistula is infiltrated, it is best to rest it for at least one treatment. If this is not possible, the next cannulation should be above the site of the infiltration. Be careful when taping needles and avoid lifting up on the needle after it is in the vein because an improper needle flip or movement can cause an infiltration. Proper needle removal prevents post dialysis infiltrations. Apply the gauze dressing over the needle site, but do not apply pressure. Carefully remove the needle at approximately the same angle as it was inserted. This prevents it from being dragged across your skin. Using too steep of an angle during needle removal may cause the needle's cutting edge to puncture your vein wall. KidneyBuzz.com understands that a primary concern of dialysis patients regarding their access care is infiltration avoidance. 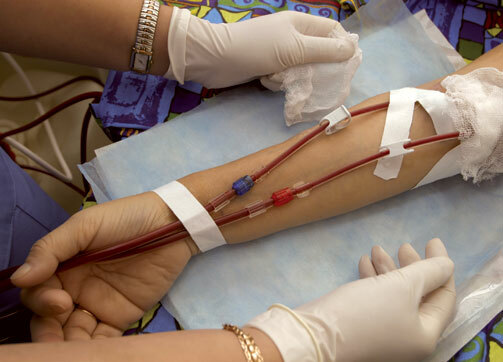 Requisite knowledge and application of best practices will assist you in minimizing incidence of infiltration that will allow the prescribed blood flow throughout your dialysis treatment, and ensure that you get the best cleaning possible.